Sky Cabin is a in The Boardwalk at Knott's Berry Farm. It's worth seeing on a time-permitting basis. For those who want the view without the adrenaline rush, Knotts offers this slow-spinning cabin ride in the sky. 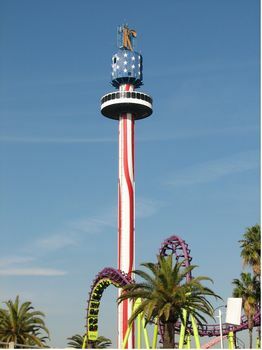 The Supreme Scream Standing 325-feet is the largest structure in Orange County, topping Knott's own landmark sky tower by 75 feet! Sky Cabin will not be closed, Windseeker is now in Fiesta Village near Jaguar. Sky Cabin is Knott's Landmark and cannot be removed from the park.